This evergreen is a must have for any small pond. 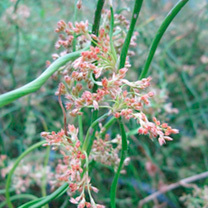 It has an unusual corkscrew twist to the cylindrical foliage. Although evergreen, cutting it back in early spring encourages fresh new growth. Flowers June-August. Minimum height 25cm; maximum height 45cm. Maximum depth 10cm. Slow growth rate. Available in two pot sizes: 3 x 9cm pots or 1 x 1 litre pot..